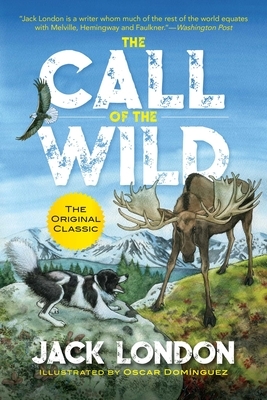 Originally published in 1903, Jack London’s The Call of the Wild is an action-filled story featuring a narrative from an animal point-of-view—Buck the dog. Buck lived happily on a ranch in Santa Clara Valley, California, until one night, he’s stolen away by the gardener’s assistant and sold to traders. Eventually, he ends up in the Klondike region of Canada, where he is trained to become a sled dog during the Alaska Gold Rush. As a sled dog, Buck now faces brutally cold nights, cruel treatment, and adversaries both animal and human, struggling to adapt and come to terms with a life that is much different than the pampered one he lived in California. It’s not until he defeats and then witnesses the death of a rival sled dog at the hands of the rest of his pack that Buck starts to shed his domesticated habits and embrace his primordial instincts in order to survive. By telling this classic adventure story from the perspective of a dog, London was able to explore the remarkable and intimate relationship between man and beast, captivating both adventure and dog enthusiasts. Now readers can enjoy what is considered one of Jack London’s greatest novels in this beautiful edition containing brand-new illustrations. Readers of all ages will be on the edge of their seats while following this thrilling and emotional story of survival and self-discovery. Jack London was born in San Francisco, California, on January 12th, 1876, as “John Griffith Chaney.” He wrote short stories, essays, and novels and worked in journalism. London was one of the first novelists to make a lucrative career out of fiction-writing, achieving worldwide fame at age twenty-seven with The Call of the Wild. He passed away on November 12th, 1916, at age forty.